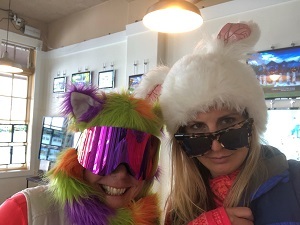 Susan G. Komen Colorado welcomed a number of new sponsors to the 2019 Snowshoe For The Cure. We love our friends in Summit County and are grateful beyond measure for all that they do to create one of the best weekends on our calendar! We’d like to take a moment to SHOUT OUT the enthusiastic support of our mission from Sue Runnels and her Water Station (and so much more) Team at Coldwell Banker Mountain Properties! We choose to share the CBMP story with our community because of its power in the fight against breast cancer, the changing landscape of corporate social responsibility, and most importantly, because it is a story of the hidden gifts we can receive when something like breast cancer brings us together. 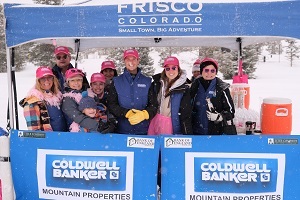 Not only has Coldwell Bankers Mountain Properties dedicated their time, talent, and resources in an effort to practice a corporate social responsibility philosophy in the Summit County community, complete with an in-house community impact committee; but this group also understands that breast cancer remains relevant and our fight against it is as important today as it has ever been. We met Sue Runnells this Fall and quickly found that she was an individual who was equally in love with her organization and her mountain community! With her magnetic personality and forceful action, she led the charge for CBMP to partner with Susan G. Komen Colorado. She touts CBMP as a leader in real estate industry ethics; and shares that CBMP is a refreshingly familiar face in a sometimes whirlwind of a real estate market; due in part to their long-term, established presence in Summit County for so long, but most importantly because of the incredible team of people that make up their organization. Sue is the voice that calls for further action and further impact on issues like breast cancer because she knows that real members of the community face the reality of living with breast cancer each day. This story highlights Susan G. Komen’s research: that individuals living with breast cancer in resort or rural areas often experience greater barriers to screening and treatment. This story is key to changing statistics like this! What’s more, is that Sue might not have asked more of her colleagues, might not have answered the call for partnership with Susan G. Komen if breast cancer hadn’t impacted her life in a very real way. Sue connects to a survivor that she called ‘grandmother’. Sue connects to a survivor that she calls ‘aunt’. Sue connects to a survivor that she calls ‘step mom’. And, last but certainly not least, she connects to a survivor whom she calls, ‘mom’. We know that breast cancer remains relevant and remains a leading cause of death for so many women in our community, in our families. And for this, we double down on the work we do! We are so proud to share that Sue’s mom is surviving and thriving and this year, she made the trip from Detroit, Michigan to celebrate her life and love as she turned 70 years young with us as we kicked off Snowshoe! This story is one of many that serve as the foundation on which our mission pillars of research, community, care, and action stand. We thank each of you for your own story, no matter where you are on the journey. We invite you to join us in our bold goal so that we can write, thrive, and live an alternate ending! That ending looks like more survivors, cutting-edge research, a community of activists mobilized for improved access to screening, treatment, prevention, and care.